Adam Equipment's HCB Highland balances are ideal for lab work, field use, and various education and industrial applications. The HCB Highland Balances feature a number of different weighing units, such as; RS-232 and USB interfaces, rechargeable battery pack and AC operation, capacity tracker, adjustable feet and level and lock down etc. 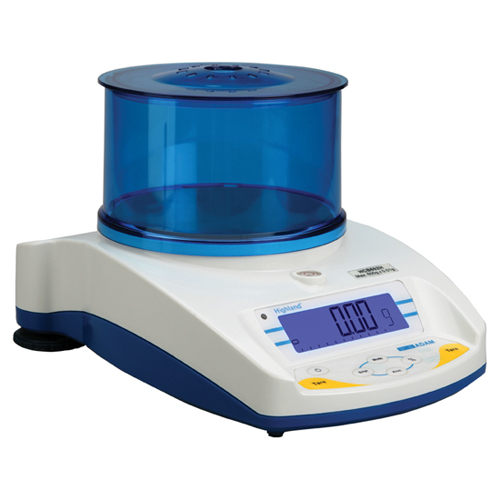 Density and specific gravity determination are simple with the below balance weighing feature, and the removable wind shield prevents wind disturbances outdoors or in drafty places. The HCB's built in applications for parts counting, percentage weighing and totalization / accumulation, means that Highland balances are full of useful features. HandiCal™ internal calibration with built in mass can be locked so you only calibrate the balance when you want to. The built in weight allows for fast & simple calibrations, allowing you to focus on weighing tasks. The built in security slot accommodates a standard Kensington™ type lock and cable to keep your balance where you want it. Three-point ShockProtect™ protection designed for the best in performance reliability. With ShockProtect™ your HCB balance can withstand up to 200kg of weight without affecting the weighing mechanism. Smart housing design lets you stack the Highland balances on top of each other for easy storage and transportation.